It’s always the way – your car breaks down at the most inconvenient of times. Whether it’s during the school run, on the way to a wedding or heading off to work – dealing with a car breakdown is no laughing matter. We’ve all been there, right? 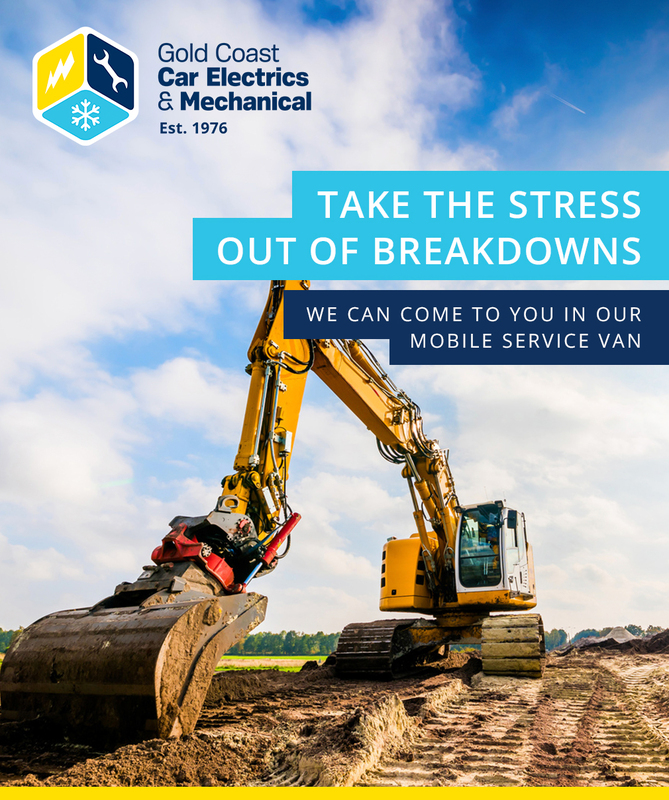 Fortunately, we can help take the stress out of vehicle breakdowns by coming to you in our mobile auto electrical service van at your convenience. We’re here to help you, no matter where you are. Whether your car has electrical problems, broken air conditioning, or even if you don’t know what the problem is but are stuck somewhere inconvenient, don’t hesitate to call us. With decades of experience, our professional team can be with you quickly, getting your car back on the road as soon as possible with our expert mobile auto electrician service on the Gold Coast. Our mobile auto electrical service has been designed with the customer in mind and for added convenience. By coming to you, we can fix many car problems on the spot, quickly and cost-effectively. If it’s apparent that your vehicle needs to be towed to our workshop, we’ll let you know as soon as we can. Hopefully, you are already getting your vehicle serviced with us and can use your roadside assistance for towing when you unexpectedly breakdown. Our mobile vans have been kitted out with most of the necessary tools needed for most breakdown situations. You can trust in the knowledge that in most circumstances, we should be able to fix your vehicle on the spot. If we can’t, you will be provided with options upfront and how we proceed is entirely up to you. We are also equipped to repair air conditioning systems, which is a big help for large equipment on work sites that can’t come to us. Our mobile service will reduce your downtime and minimise excess cost. Our fully equipped breakdown vehicle can carry out most auto electrical repairs, including the replacement of car batteries on site. We also offer customers an exceptional mobile air conditioning service to ensure you’re never stuck without a working aircon again. This can be especially important for on-site equipment. • Benowa… and the surrounding suburbs. Call on us today for a diagnosis, repair or installation, which can all be done from our mobile service vehicle. If you’re looking for a great mobile auto electrician on the Gold Coast, then you’ve found the right team! Give us a call on (07) 5597 4774 today. Make a booking with us today. If you are looking for a team of qualified mechanics and auto electricians to take good care of your vehicle, look no further than GCCEM.Contact us today for more information on our services or to book an appointment. ©2019 Gold Coast Car Electrics & Mechanical.